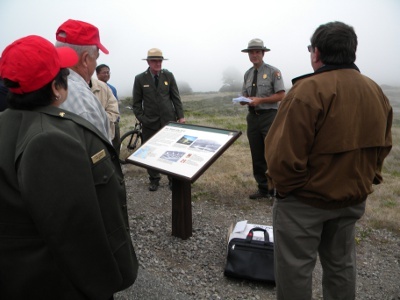 August 13, 2011- Milagra ridge, the former Launcher Area of Site SF-51, Pacifica, California, was foggy and chilly as the Nike Historical Society, Dave Bridgman (representing his family), and the National Park Service dedicated two informational signs. 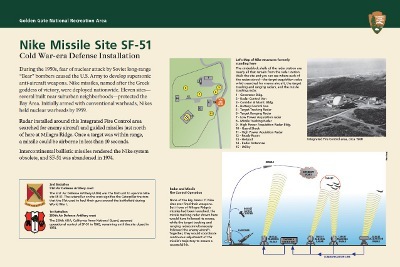 The signs explain the former Launcher Area and IFC. The signs also serve to memorialize the Army and National Guard units that manned the site. One sign overlooks the former Launcher Area and the other is located at the former IFC Area. 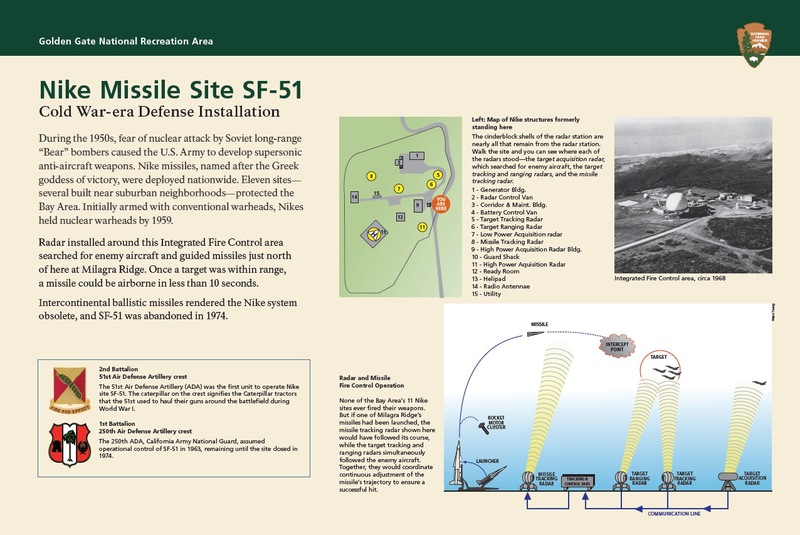 Since both areas are on National Park Service land, the signs will be permanent fixtures for future generations of Americans to learn about the Nike Site that once occupied the area and the important role it played in the Air Defense of our nation. Phil Vesco, a battery officer in AA when it was still guns, later became battery commander of the first California Army National Guard site activated at Ft. Funston. His son drove him to the SF-51 sign dedication from Sacramento. Nike Historical Society board member Gordon Lunn (also attending) worked for Bill Story (did not attend) in the Los Angeles Defense. Bill Story had worked for Phil Vesco in the San Francisco Defense. 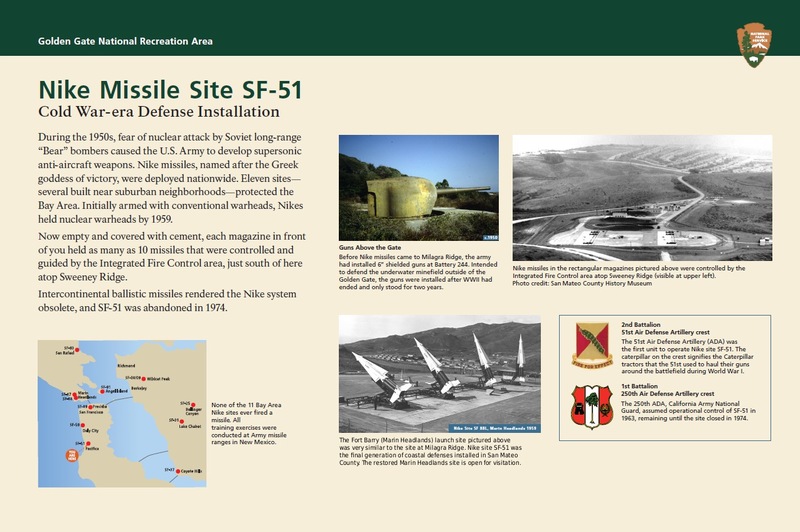 David Bridgman, a National Park Service docent who interprets both Sweeney (IFC) and Milagra (Launcher) Ridges, and who worked with us on the waysides, also served at SF-51 as did his father before him. 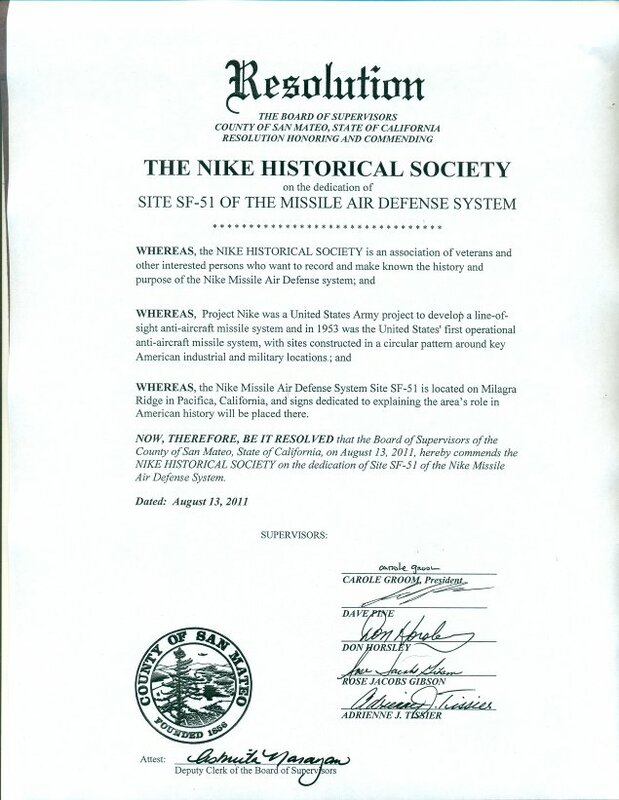 Historian Steve Haller spoke of the historical background of the site and the Nike defense in the Bay Area. 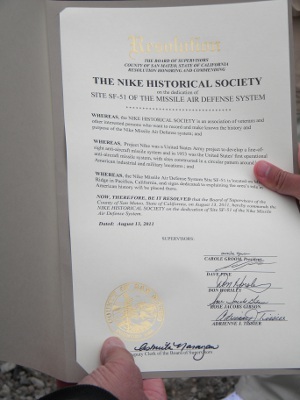 Randy Torrijos, Legislative Aide to San Mateo County Supervisor Dave Pine, read a Resolution passed by the County Board of Supervisors commending the Nike Historical Society for undertaking the project. 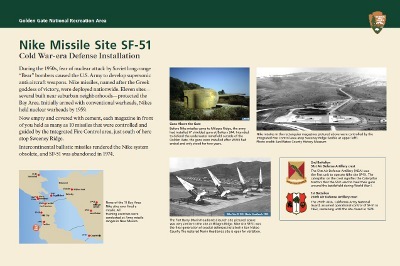 An Army Nike soldier who served at SF-51 said, "I trained those National Guard guys." 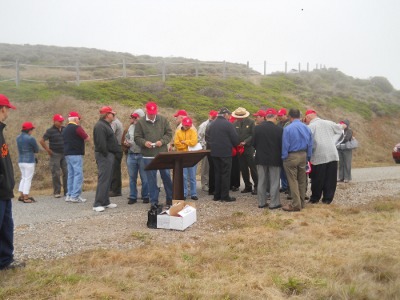 The 30 attendees were given Nike Historical Society patches and red hats. Al Kellogg, Nike Historical Society President, presents a plaque to George Durgerian in appreciation of his work to get the signs installed. 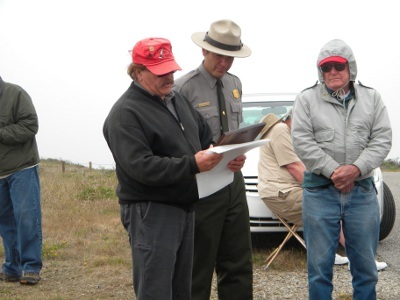 National Park Service employees Stephen Haller (left) and George Durgarian (right) spoke to the group. Nike Historical Society Secretary Ezio Nurisio (far right) was the Society's lead in getting the signs designed and installed. Brenda stands next to the sign at the IFC. 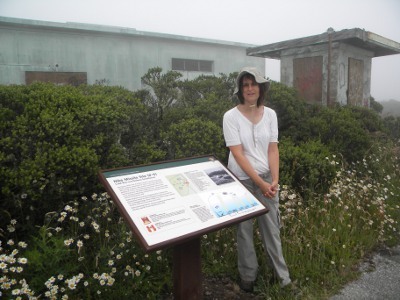 The IFC is now part of Sweeney Ridge in the Golden Gate National Recreation Area. Milagra Ridge is off of Sharp	Park Road in Pacifica. Pacifica is just south of San Francisco, California. From Highway 1, follow	Sharp Park Road to the east, or from Skyline	Boulevard (Highway 35), follow Sharp Park	Road to the west. Turn north on College Drive	and continue about 1/4 mile to roadside parking	at the Milagra Ridge gate. Walk about half a mile from the gate to the former launcher area.